Earlier this year I was approached to write a one act play for the Actor’s Theater of Orcas Island for a November production. Honored with the privilege of having my play in the company of two superlative playwrights, Lin McNulty and James Wolf, I realized that 30 minutes of slapstick comedy (what I generally do for my ten minute plays) wasn’t going to work. Armed with the theme of Homecoming, I set about doing something different. During this time, my parents had stumbled upon an episode of the 48 Hours, which to their disbelief featured a friend’s son, a childhood friend of my brother’s. John Wall is accused and charged with murder of his ex wife Uta, von Schwelder. This tragedy haunted me. Mostly, I hate to think of the children experiencing this nightmare involving their parents. The trial isn’t until next year and may or may not prove to be murder, but it did make me wonder what could drive someone to kill . . .
From this, I found a foundation of an idea. A man, a woman, and another unusual character (you’ll have to see the play to understand). While I worked on my play, Ray Rice’s abuse story flooded the news media. In my advanced composition course, students writing on the topic shared their stories about domestic abuse. But, it isn’t that easy. This hashtag created by Beverly Gooden prompts many stories on Twitter. Obligation, financial, children (or not), religion, fear, love, confusion . . .
the belief that the person abusing will change. The thing is a relationship cannot be all good or all bad. The places where Love/Hate Possession/Freedom Passion/Pain intersects . . . This is where bad (or good) can happen, and I chose to explore the situations where things go wrong. It takes courage to leave an abusive relationship. It requires stepping off a precipice into a deep unknown. Leaving often means changing everything and having the resources and support to do so safely. Leaving can also mean creating a more dangerous situation if the abusive partner cannot let go. This month, Orcas Island hosts the Silent Witness Initiative. 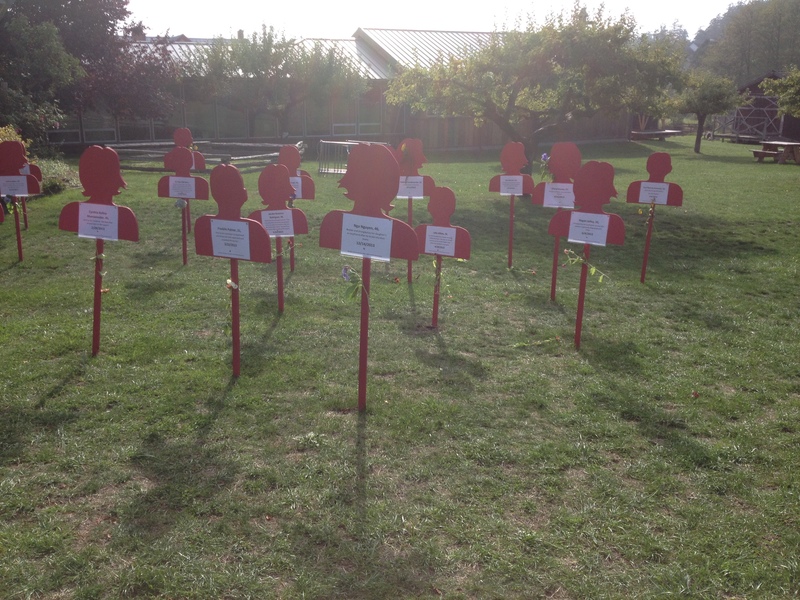 If you go to the Village Green in Eastsound, you will find twenty-six silhouettes of those who died from domestic violence this past year in Washington State. In the October fog, the image is reminiscent of a graveyard, a reminder of where domestic violence can lead. In November, “Lilacs” will open with two great plays by Lin and James. For those of you on Orcas, I hope to see you.